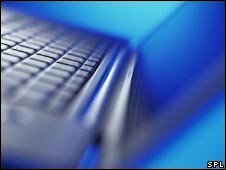 The MoD said it was treating the breach "extremely seriously"
The Ministry of Defence (MoD) is investigating the theft of computer files holding the records of thousands of serving and former RAF staff. The information was stored on computer hard drives at the Service Personnel and Veterans Agency at the RAF Innsworth site near Gloucester. The theft of the files took place on 17 September, within a high-security area on the base. The MoD has set up a helpline for people who have been affected. It said it was treating the breach "extremely seriously". A spokesman for the MoD police said: "We can confirm that an investigation is being conducted by MoD police, with the support of Gloucestershire Police into the apparent theft of three USB portable hard disk drives. "In view of the ongoing nature of police inquiries, it would be inappropriate to comment further at this stage." It is not yet clear how many people's records were affected. But two of the drives are believed to have contained potentially sensitive personal data, while the third hard drive did not contain any personal data. It is thought the missing drives contain appraisal forms which included names, dates of birth, service numbers, and bosses' opinions of staff. The spokesman said the email addresses are MoD e-mail addresses and bank details are contained in a minority of cases. The agency provides support services for some 900,000 serving and ex-service personnel. Nick Harvey, Lib Dem defence spokesman, said: "This is just the latest in a seemingly endless stream of stories involving personal information being lost or stolen. "The first priority has to be ensuring that nobody's security has been put at risk, but we also need a serious look at the way such sensitive data is being handled. "The current situation is unacceptable." Former shadow minister for homeland security, Patrick Mercer, said if the theft was an "internal job" he would be even more concerned. "If this was some sort of opportunity theft by, you know, 'Joe Burglar' - fine. "But if we're saying that this is an internal job which is targeted at some specific form of information, then I'm afraid my alarm bells ring even more." Former government defence advisor Air Vice Marshall Tony Mason, from Cheltenham, said: "If the material was important enough to be in a high security department, locked in a high security cabinet, there should be a record of that material going in and out. "One thing I couldn't establish was what proportion of the information has gone astray, but I would be very, very surprised if this was a break-in from outside." Concerned serving and former RAF personnel can e-mail rafdata@spva.mod.uk or phone the helpline on 0800 085 3600.